Perhaps more than any other factor, consumers’ failure (or refusal) to differentiate between their search and browser bars shaped search behavior in 2011. “Navigational searches dominated the top search results as users typed in terms versus typing in the URL in the browser bar,” explained Simon Bradstock, general manager of Experian Hitwise. Where were most consumers trying to navigate? Facebook -- as the social network ranked as the top-searched term for the third straight year. More sought after than ever, searches for Facebook accounted for 3.10% of all search activity in 2011, which represented a 46% increase over 2010. Also of note, Hitwise saw 11% growth of single-word searches in 2011 as terms like “face” and “you” made the top 50 searches. What should Madison Avenue take away from these findings? “Marketers need to be particularly brand-savvy when managing their search optimization campaigns because of this behavior, which is a result of predictive search functionality across major search engines,” according to Bradstock. Other top 2011 searches reflected consumers’ tireless fascination with celebrities, while many of the top fast-moving searches centered on natural disasters or notable personalities passing away. Regarding Facebook’s popularity, four variations of the term “facebook” were among the top 10 terms, which actually accounted for 4.42% of searches overall -- a 24% increase from 2010. Among the top 10 terms, “youtube” moved up from the third spot in 2010 to the second spot in 2011. 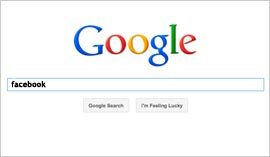 “Facebook login” was the third-most-searched term in 2011, followed by “craigslist” and “facebook.com.” Facebook.com moved up one spot in 2011 to be among the top five search terms. Analysis of the search terms revealed that social networking-related terms dominated results in 2011, accounting for 4.18% of the top 50 searches. This represented an increase of 12% compared with 2010. When combined, common search terms for Facebook -- e.g., facebook and Facebook.com -- accounted for 3.48% of all searches in the United States among the top 50 terms, which represents a 33% increase compared with 2010. YouTube terms accounted for 1.36%, representing a 21% increase compared with 2010. Google terms (including YouTube) accounted for 1.59% -- an increase of 27% compared with 2010. Yahoo terms, meanwhile, accounted for 0.59% -- an increase of 15% compared with 2010. New terms that entered the top 50 search terms for 2011 included addicting games, amazon.com, cnn, chase online, face, facebook sign up, hotmail, lowes, pandora, twitter and you.